Peace be upon you, my children. …Actually, I’m pretty sure that you can’t all be my children; I know I have a few, but I really don’t think it was that many – and besides, if that were the case, then I have to say that some of you are looking pretty ropey considering you’d need to be at least twenty years younger than me. Well, this week we can report on our Bristol City Stadium Gig – yes, folks, we have now entered the hallowed arena (as it were) of being a Stadium Rock Band. Tick that one off the bucket list. …well, except that we weren’t actually playing in a stadium, it was more kind of.. outside one. On a trailer. Entertaining the rugby fans queueing for burgers. But – it was a very nice trailer. 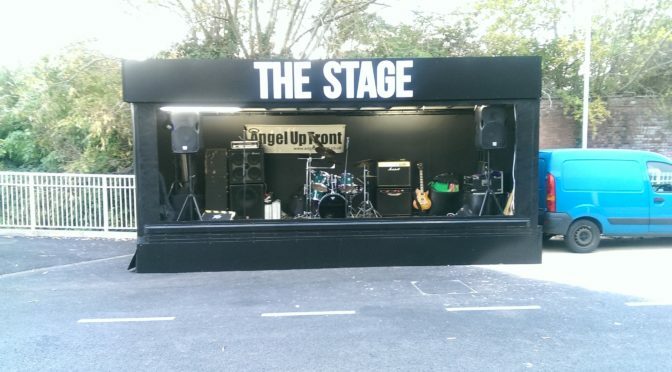 Nice and clean and tidy, with electrics, and a roof, and, by way of subtitles for the hard of thinking, it had the legend “THE STAGE” emblazoned in bold letters above it. And the burgers were pretty good, too I have to say – even if, despite Rosa dedicating a couple of songs to them, they wouldn’t give us any free ones. So, we arrived, we set up, and then… we waited until it was our allotted time to start playing. And then we played. It took us a while to get the burger queue warmed up, but eventually we managed to get a decent enough response out of them. So, we played on until the match started, and then sat in the relative warmth of the bar, until half-time, when it was time for our second allotted fifteen minute set. For this part, most folks were still huddled inside the stadium for warmth, but a few dedicated drinkers came out and danced around, some actually missing the start of the second half of the match in order to watch us finish off the last number. Aww, bless. So, I think we’ll call that a result. Obviously, after playing a major stadium gig such as that, we need to take a rest to recover – and so we’re actually taking next weekend off. But calm yourselves, we’ll be back – and what’s that I can see just appearing over the horizon? Is that Halloween I can see? Very well, if we must, I suppose….